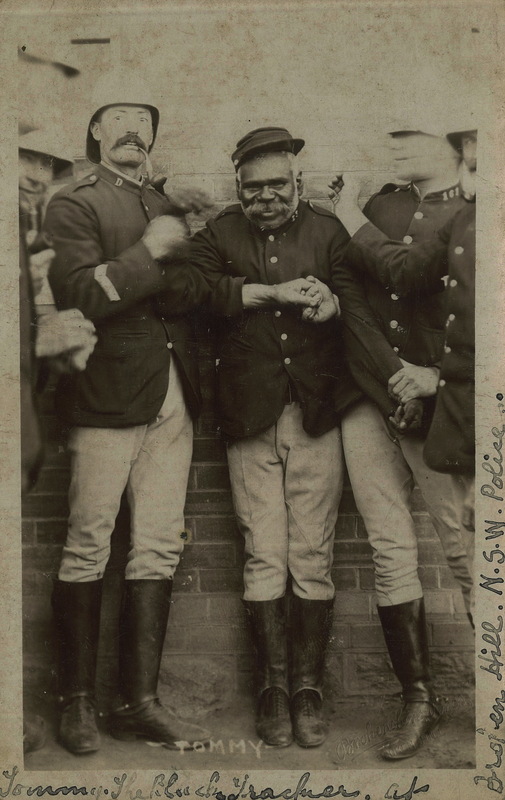 An Aboriginal man named Tommy was the tracker at Broken Hill from the early 1890s through to 1910. Unfortunately, little is known about his personal details. His surname was not recorded in official documents or in the press. He participated in numerous investigations in the Broken Hill district, including the pursuit of robbers who stole a safe from the Commercial Hotel in December 1899. Tommy quickly picked up the tracks of the horse-drawn cart used to transport the safe which led to a site near the North mine tailings heap at Round House Creek. The “mutilated” safe was found in the dust Barrier Miner 5 December 1899: 5.. Earlier in the same year Tommy had followed bicycle tracks across gravelly ground which led him to the camp of the notorious “pantry robber” at a cave near Stephens Creek to the north of Broken Hill. The robber escaped by swimming across a reservoir and heading to the Eaglehawk Range, but much of his ill-gotten booty, including a box of surgical instruments stolen months earlier, was recovered. Tommy was praised for his “marvellous skill” and patience in locating the camp Barrier Miner 1 April 1899: 1. Tommy also gave evidence in court, including an 1895 case against man who allegedly stole sheep formerly owned by the well-known Kidman pastoral family. Tommy testified that he had tracked the stolen sheep and a horse from a slaughter yard in West Broken Hill to Mount Gipps, a distance of about 15km Barrier Miner 24 April 1895:4.. The accused, William Athorn was later acquitted of at least one of the charges Sydney Morning Herald 23 July 1895: 7.. Towards the end of his career, other policeman bailed up Tommy to appear in a photograph. Although he is smiling, the other police are holding Tommy in place and he appears not to have readily agreed to the photograph. 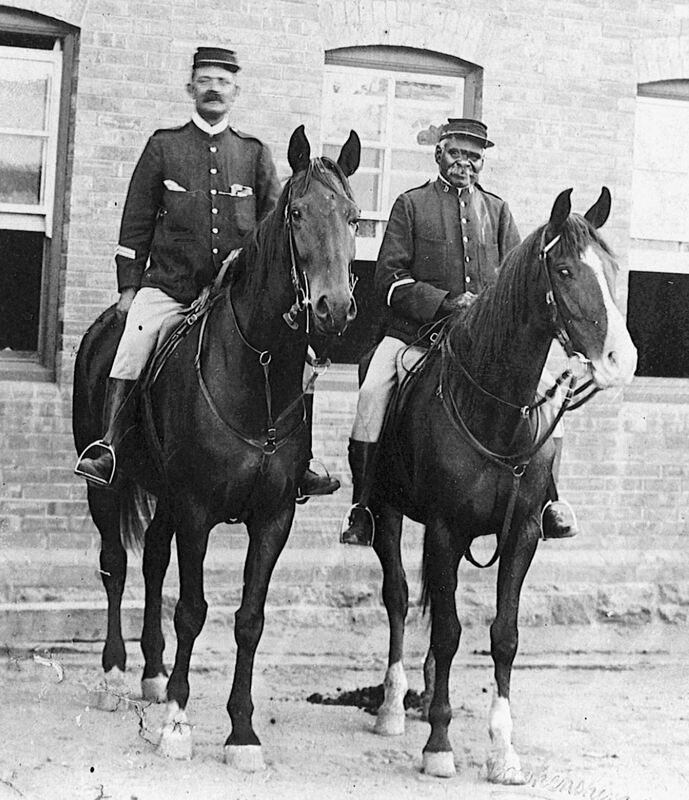 Writing on the back of the photograph confirms that the “troopers had a job trying to get Tommy the Black tracker to hold up his head to get his photo taken“University of Wollongong Archives D82/7..
1. ↑ Barrier Miner 5 December 1899: 5. 3. ↑ Barrier Miner 24 April 1895:4. 4. ↑ Sydney Morning Herald 23 July 1895: 7. 5. ↑ University of Wollongong Archives D82/7.